A 1995 Honda Accord, driven by Cathy D. Adams, was pulling into a parking space in the lot. The vehicle suddenly accelerated, overrode the curb, continued across the grass, and struck a bicycle rack. The Honda rotated back into the parking lot and struck a tree. It continued to rotate and struck two parked cars. Upon impacting the other vehicles, the Honda overturned, coming to rest on its top. A pedestrian, Tommy H. Smithson, was standing between the two parked cars that were struck by the Honda and was injured when one of the vehicles was knocked into him. Ms. Adams also sustained injuries in the crash and had to be extricated from her vehicle by the Kingsport Fire Department. Both individuals were transported to area hospitals by Sullivan County E.M.S. for treatment of what appear to be non-life threatening injuries. One of the parked vehicles was unoccupied. 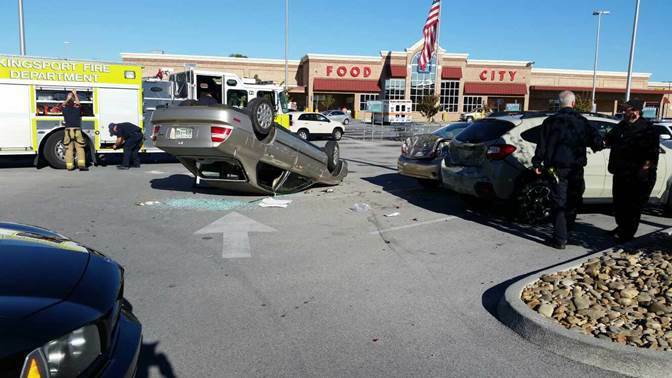 The other parked vehicle was occupied; however, the occupant was not injured. Both were legally parked. Ms. Adams stated that she believed that her accelerator had stuck; however, an inspection of the accelerator by the officers revealed that it appeared to be functioning properly. As the crash occurred on private property, no citations were issued for any traffic violations.